For the latest in my “Tales from ACNA-Land” series, I’m writing about something that will be unpleasant for my friends in England. You see, ACNA or ACE or EACNANA or GAFCE or some such is coming to a village near you. Make no mistake, the secessionist agenda will spread to England as the C of E inevitably disappoints the radical right wing in its efforts to reshape Anglicanism. Tobias Haller does a nice job of putting the shoe on the other foot. What would be done in the Church of England if the clergy and parish council of a parish in, shall we say, Dibley, announced that it was no longer part of the Church of England, but considered itself now to be a congregation of the Church of the Province of the Sudan, altered all of their signage and other public information to reflect this change, purporting now to be part of “The Anglican Church in England” and invited bishops from the Sudan to function in the parish, refusing to have anything more to do with their C. of E. diocese or its leadership? This will happen, as Tobias writes. Do not doubt this will be going on in a few months or perhaps a few years. The only chance to stop it is to look at the whole narrative and act accordingly. 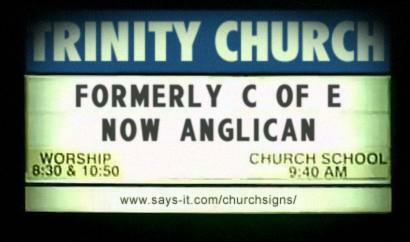 Did the Episcopal Church throw anyone out just for having the wrong theology? No. Did General Convention go out of its way to leave space for everyone in the proverbial big tent? Yes. Did ACNA and other radical people get frustrated and decide they wanted to form their own new church? Yes. And did they attempt to walk off with the silver? Yes. Like dealing with a child who is throwing a tantrum, you cannot reward bad behavior. Recognizing secessionists in America ensures they’ll be in England sooner rather than later. Making it clear that they will not be recognized by the Anglican Communion because they chose to walk apart will at least slow them down. When the Anglican Fellowship of Convening Global Christians (Southern Cone in England) sets up shop in your town, remember you heard it here first. General Synod should at least slow this down by giving ACNA a “time out” and not a treat. This post is part of a series, Tales from ACNA-Land. Read the previous post. Fr. Tobias has the whole dizzy business of ACNA and its affiliates in a nut-shell. If the C.of E. General Synod encourages ACNA into the Communion, this will not fix any problems. Before one can say ‘Nigeria’, there will be a flood of overseas *missionaries* from CANA and the GAFCON countries (including Sydney ‘Anglican’ Diocese) looking to take over vaccilating parishes in the U.K. And what will happen to the role of Canterbury then?